Shropshire Children’s University was initially launched at St Peter’s in May 2011. St Peter’s was the first rural school in the country to establish a Children’s University. All children from Reception to Y6 are enrolled as ‘undergraduates’ and provided with a free ‘Passport to Learning’ (further details below). What is Shropshire Children’s University? Shropshire Children's University is now run by a group of Shropshire schools and membership is entirely free for children at those schools. The Children's University Learning Destinations scheme, which is offered nationally, helps children discover that learning does not only occur during school hours. It encourages children to develop new skills and interests, helps raise aspirations and empowers children and young people to take ownership and responsibility for their own learning, which is important to us as a school. Every activity offered through the Children’s University has been checked to make sure it provides the highest quality learning experience. How do children collect activity stamps? Children earn credits by taking part in a range of activities at Learning Destinations validated by Shropshire Children’s University as providing high quality education. Learning Destinations include Blists Hill, Park Hall Farm, Mythstories, Coalport China Museum, Acton Scott Historic Working Farm and Shropshire Hills Discovery Centre. If you are going on holiday or visits further afield check the National Children’s University website for Learning Destinations across the country www.childrensuniversity.co.uk. Due to the high quality of the learning experiences offered at St Peter’s, children also get credits for taking part in extra-curricular clubs and educational visits and working with visitors or theatre groups. Children are awarded one credit for each hour of accredited learning undertaken at a validated Learning Destination (rather than credits related to the number of hours the activity lasts) and each approved educational visit or visitor (e.g. such as the Animal Man). Every child is given a special ‘Passport to Learning’ to collect activity credits each time an event or activity is attended. 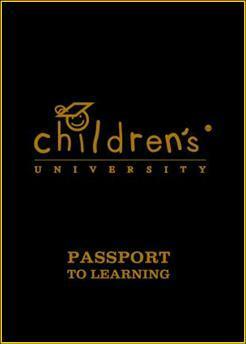 Children are responsible for looking after their own Passports. We check how many credits each child collects on a Termly basis so we can provide certificates. Bronze, Silver and Gold certificates are awarded at Children’s University Undergraduate, Postgraduate and Doctorate levels. Bronze and Silver Awards are presented at Graduation Assemblies held at school. 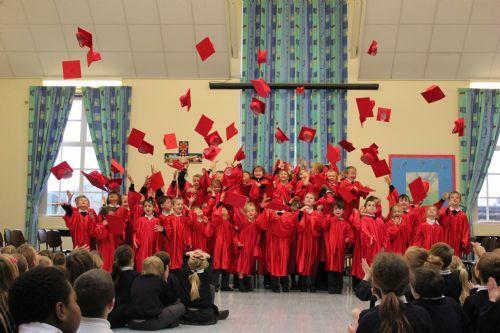 Gold Awards are presented at a partner university such as Birmingham, Chester, Keele, Staffordshire, Wolverhampton or Harper Adams University - complete with gowns and mortar boards for the children to wear! Certificates are awarded based on the number of credits received, they can be gained by all children irrespective of ability. To Graduate children need to complete 3 cycles of Bronze, Silver and Gold. They can then progress to a Masters and eventually even a Doctorate!